It’s true. I have used clove tinctures in babies for over 5 years. And, clove essential oil is not recommended for little ones. Many people get confused on this. How can one be safe…and the other not be? What’s really going on here? The concern with cloves is a chemical called eugenol. This chemical is extremely potent, and is responsible for the plant’s anti-fungal, anti-bacterial, anti-inflammatory, and even insect-killing properties. In high concentrations, yes, it can be dangerous. The undiluted essential oil contains approximately 89% eugenol, which is why it’s not recommended in babies. Even diluted to a level of 2% (which is the equivalent of just 6 drops in a 10-ml roller bottle) is 1.7% eugenol, and is too powerful for babies. That level is safe for adult use. On the other hand, a tincture is quite different. 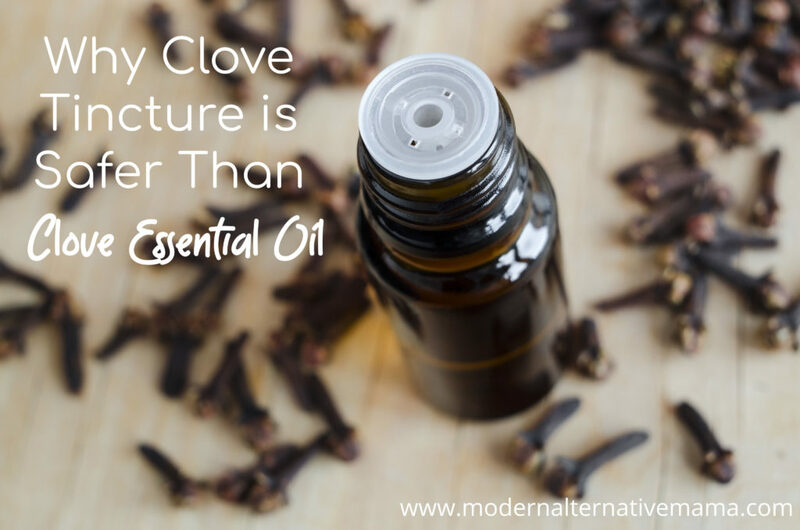 Whole cloves contain, on average, just 9 – 14% essential oil. This means just 8 – 12.5% eugenol. In my recipe for clove tincture (for babies), it calls for just 3 oz. (85 g) of whole cloves per gallon of liquid. Once that liquid is finished, the amount of eugenol in the actual tincture is under 0.2%. So, you can see that the amount of eugenol in a tincture is 1/10th what it would be in diluted essential oil. That’s why the tincture is safe, and the essential oil isn’t. Still worried? Well, eugenol isn’t just found in cloves. It’s also found, in small amounts, in fruits — like raspberries and bananas! The concentration of eugenol in a banana isn’t a whole lot different than in a clove tincture. If you’re not worried about giving your child a banana to eat, you shouldn’t be worried about clove tincture, either. Clove tincture is excellent for teething babies! It provides just a little bit of pain-relieving, numbing qualities. It’s been my favorite teething remedy for years now. 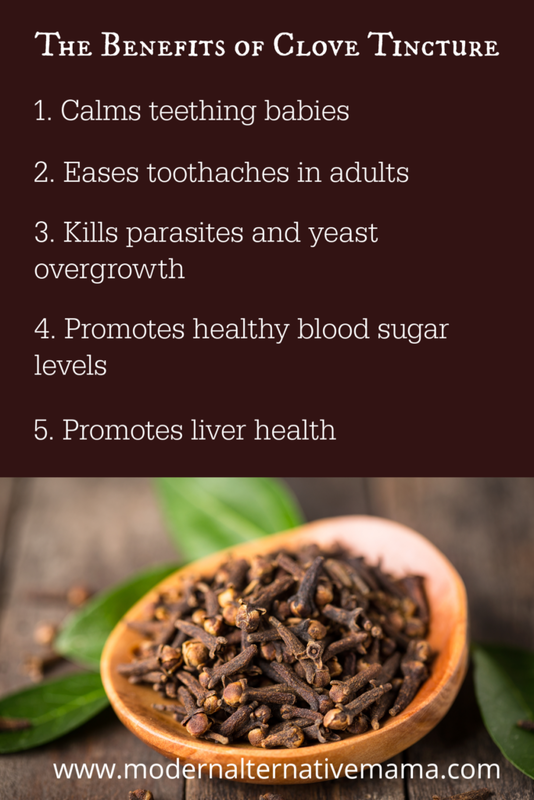 Clove tincture is also great for gut health — it can help to kill parasites and yeast overgrowth. It may also help with ulcers or other stomach issues. Cloves also stimulate the liver, and can promote overall liver health. And if your liver is working well…then your body can detox naturally! Basically…cloves are awesome. Get them in your diet. 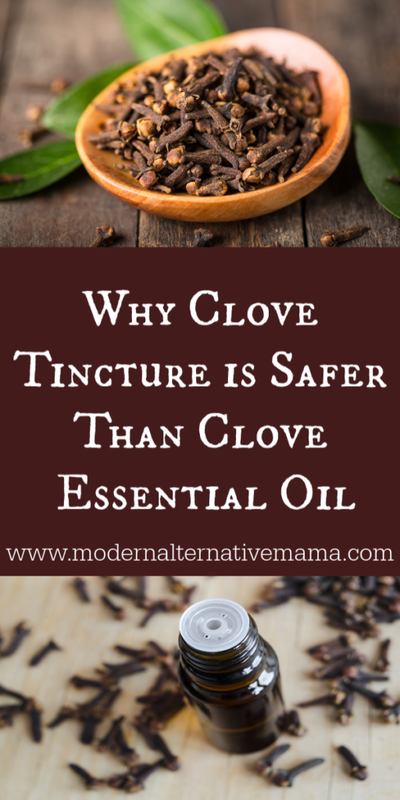 Did you know about clove tincture? Do you use it?